Carolyn's not so different from the other people around her. She likes guacamole and cigarettes and steak. She knows how to use a phone. Clothes are a bit tricky, but everyone says nice things about her outfit with the Christmas sweater over the gold bicycle shorts. After all, she was a normal American herself once. That was a long time ago, of course. Before her parents died. Before she and the others were taken in by the man they called Father. In the years since then, Carolyn hasn't had a chance to get out much. Instead, she and her adopted siblings have been raised according to Father's ancient customs. They've studied the books in his Library and learned some of the secrets of his power. And sometimes, they've wondered if their cruel tutor might secretly be God. Now, Father is missing—perhaps even dead—and the Library that holds his secrets stands unguarded. And with it, control over all of creation. As Carolyn gathers the tools she needs for the battle to come, fierce competitors for this prize align against her, all of them with powers that far exceed her own. But Carolyn has accounted for this. And Carolyn has a plan. The only trouble is that in the war to make a new God, she's forgotten to protect the things that make her human. Okay, I didn't know what to expect with this one. I don't think I ever would have read it, but I just joined a book club and this was the pick. I had never even heard of this book before. For the first 10% of the book, I was convinced this would be a two star read. The beginning was a bit confusing and new characters kept getting added. Actually, I am still not sure what I just read, but I do know that I loved it. Carolyn was a normal girl until her parents died when she was eight or nine. Then Father adopted her and a bunch of other kids. It is unclear whether Father is the creator of the Universe, but what is clear is that he is thousands of years old and is very vengeful and disturbing. He assigns each of the kids a different catalog of the Library. Carolyn is in charge of languages. There is also war and medicines and math, among others. Father and the kids play fast and loose with the rules of physics. 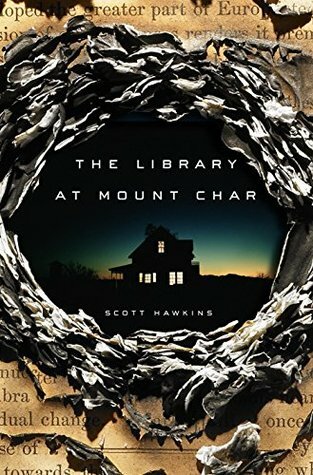 At the beginning of the book, Father is missing and there is some kind of perimeter defense around the Library that prevents anyone from getting to it. Margaret, Jennifer, Michael and David are the main ones that are trying to find Father and trying to find a way back into the library. Like i said earlier, there are lot of different characters introduced. There are all the kids, Carolyn, Steve, and Erwin and even some pretty awesome lions. I had no idea what the plan was or where everything was headed until 70% of the way through the book. I think that was the point where all the pieces of the puzzle just kind of came together. But even though I had no clue what was going on for most of the book, I was still hooked. I did not want to put this book down. It was kind of funny, but also very dark and disturbing. The world building was fantastic, even though most of your questions don't get answered until the end. The Library was something that even Belle from Beauty and the Beast would have envied. I want that freaking library! Carolyn was a very unique character. She is kind of naive about the world around her, yet she is a genius and people wildly underestimate her. I thought I hated her at first, especially because I had n clue whether she was a villain or not. But once I learned everything she had been through, I understood her anger and I understood her plan. Of course, even after things fell apart, she still didn't understand why Steve had a problem with some of the stuff she did. She was just very, very focused on the bigger picture. All the small stuff, like how humanity would react to her deeds, were just little inconveniences to her. The ending of this book provided an excellent segway to a sequel, should the author choose to write one. It doesn't appear that there is a sequel in the works. But if Scott Hawkins wants to give us more of Carolyn, I am all for it! Oh I really hope you enjoy it, Lily! It is original times a thousand! It's already on my list, and I've heard wonderful things - now confirmed by your review as well :) Can't wait to get my hands on it! Awesome Ramona. I hope you love it! Thank you! The end is worth it for sure. Usually I don't like books that take a while to reveal everything. But it really worked in this one. Wow, this sounds so different to my normal reads but I'd love to try it. I really want to know who Father is! Thanks Trish! The way everything connects is pretty awesome. So I have seen this one here and there and it does sound interesting. If I do pick it up I will have to remember to just hang in there and enjoy and it will come together at some point. Great review! Thanks Grace! Yes, definitely hang in there. I swear, I almost DNF'd at first because it was so confusing. I am really glad I hung in there. The author blew my mind in the best way. Top Ten Tuesday - Top Book Series I Quit!